Ensure scrum half (and scrum half replacements) are briefed to the new protocol. a) If on the far side of the scrum to the put-in the referee will raise his hand and nod his head in a yes motion when he is happy for the ball to be put-in. b) If on the same side as the put-in the referee should tap the scrum half on the back when he is happy for the ball to be put-in. Below should be included as a protocol to be adopted if refereeing under age games and women and girls. With under age games suggest that when you brief the scrum half the coach is present so there can be no ambiguity regarding where and how you will touch the scrum half to indicate they can put the ball in. Alternatively, if you are uncomfortable with this, manage the scrum from the far side to the put-in but please ensure the safety elements and need to move to put in side if the need arises. With male referees refereeing women and girls matches please ensure a similar process is adopted to ensure there is no doubt about where the contact will be made. If necessary, whilst the protocol indicates touching the scrum half on the back, at underage and women and girls games you may feel more comfortable touching the player on the shoulder but it is essential that the player is briefed accordingly. Law 3.11(b) A player who leaves a match because of injury or any other reason must not rejoin the match until the referee permits the player to return. The referee must not let a player return until ball is dead. Law 5.7(e) If time expires and the ball is not dead or an awarded scrum or line out has not been completed, the referee allows play to continue until the next time that the ball becomes dead. The ball becomes dead when the referee would have awarded a scrum, line out, an option to the non-offending team, drop out or after a conversion or successful penalty kick at goal. If a scrum has to be reset, the scrum has not been completed. If time expires and a mark, free kick or penalty kick is then awarded, the referee allows play to continue. Law 8.3(f) After the ball has been made dead. Advantage cannot be played after the ball has been made dead. Team A have a player waiting to return from a temporary exclusion and the period of exclusion has expired. They kick the ball into touch. Team B wish to take a quick lineout. Does the referee allow the quick lineout or allow the player from Team A to return to the field? Same scenario but a substitution has been asked for rather than the end of a temporary exclusion period. The referee in such circumstances is entitled to allow a team to take a quick throw-in. If the referee allows a quick throw-in, the player who has been temporarily suspended or replaced will be permitted to rejoin the match at the next stoppage in play as decided by the referee. This section of Law does not appear to have been applied in any professional or international competition since it was introduced in 2009. It is current practice that if the ball is kicked and touched in flight by an opponent, we have seen refereed rule that any teammate of the kicker who is in front is now deemed onside. This Law says “touches or is played”. Under the Definitions of the Game, ‘touched’ and ‘played’ mean exactly the same thing. The definition of “Charge Down” in Law 12 clearly indicates that the ball does NOT have to travel forward from the player charging down to be considered a charge down (stating that charge down “is not a knock-on even though the ball may go forward”). We question how Law 11.4 (f) can distinguish between the ball being touched in flight after being kicked and the ball being charged down if there is no such difference between the two. Even assuming it was argued that a charge down must travel forward (not supported in Law) this Law seems difficult to apply. If a ball ricochets off a player charging down an travels, for example, either in a perpendicular direction to the player charging down, or bobbles into the air and lands merely 2 metres behind the player charging down, the 10m Law would presumably apply and offside players (potentially an entire team) must retire 10m from where the ball lands or behind the kicker. This seems impractical to enforce and vastly at odds with current practice. A good example of unworkability of this Law is RWC Game NZ v Tonga, at 12.45 first half. The ball is kicked by black 9, touched in flight by red 11, then played by red 5. Then black 2, who is within the 10m of where the ball was played by red 5, attempts to dive on the ball. Since a player inside the 10m cannot be put onside by the action of an opponent as per Law 11.5 (b), according to current Law this should be a PK to red. The act of a charge down is one where an opposition player not in possession of the ball approaches a kicker at close quarters and makes an attempt to block the kick. In such circumstances players in front of the kicker who are within 10 metres of the kick are not liable to penalty wherever the ball lands. If the ball is not charged down but is played or touches an opposition player and a player from the kicker’s side is within the 10 metre area in front of the kick that player is liable to penalty in accordance with Law 10.4(f). The deletion of 11.4(f) would require a Law amendment. The Irish Rugby Football Union has requested clarification that apart from a kicking tee no other item or implement may be used. (d) The kicker may place the ball directly on the ground or on sand, sawdust or a kicking tee approved by the Union. There have been instances where the kicker has used another marker to indicate where he wishes to place his non kicking foot; or to sight/line up the ball with the posts. It is our view that these additional assists falls outside Law. The Law permits the use of a kicking tee or sand to elevate the ball so that it can be kicked. No other equipment, sand or other implement may be used to assist the kicker. – if they drove forward with the ball at the back (did not release the ball), the referee would award a scrum for “accidental offside” rather than PK for obstruction. The SRU has requested clarification on whether the below interpretation of Law 9 in Sevens also extends to Fifteens. Who can or should inform the referee of the team’s decision to opt to take the conversion or not? Can anyone or must it be the captain, try scorer or conversion taker? Or any of the foregoing, bearing in mind that one of the foregoing individuals may be some distance from the referee and be inaudible? Are there any specific words or signal that must be used to indicate to the referee of the team’s decision as to whether they will take the conversion or restart play? In relation to the timing restriction on when a team can opt not to take the conversion and to instead restart play, what happens if there is a delay in the referee ruling that a try has been scored (i.e. if he is behind the player or the TMO is consulted) which results in the clock going past 0.00? When a scrum half attempts to retrieve the ball from a ruck, the ball is not out until that player has picked the ball up from the ground. Click below to see video. (a) A tackled player must not lie on, over, or near the ball to prevent opponents from gaining possession of it, and must try to make the ball available immediately so that play can continue. The RFU requested clarification relating to the operation of the HIA protocol which is set out below. Under the TMO protocols the temporary replacement for a player undergoing an HIA cannot kick for goal. If the player undergoing assessment does not return within ten minutes, the temporary replacement becomes permanent and the replacement is then permitted to kick for goal. If the fourth official is notified within ten minutes that the player has been assessed will not be returning, can the replacement then kick for goal before the ten minutes has elapsed? Our understanding is that if the replacement player is sent off then the player having an HIA assessment is not permitted to play any further part in the game i.e. he cannot act as a replacement for another player. If this is correct then a red card issued to a player whilst he is acting as a temporary replacement potentially prevents two members of that team from participating further in the game; this does not seem equitable and is contrary to what is permitted if a front row player is temporarily replaced and his replacement is sent off. Is our understanding correct? It is our understanding that a player who has previously been tactically replaced can act as a temporary replacement for a player undergoing an HIA assessment. If a player fails an HIA it is clear from the protocol that the temporary replacement becomes permanent even in the circumstance where the temporary replacement had previously been tactically replaced. What is not clear it what happens if the player does not fail the HIA, does not present for return within ten minutes and the temporary replacement had previously been tactically replaced ie the temporary replacement was not eligible to return to the game other than as a replacement for a player undergoing an HIA or a player having bleeding controlled. What should happen if a player who has not failed an HIA does not present himself to return within the ten minutes specified; does the temporary replacement become permanent in all circumstances? This is not an issue if the temporary replacement was an unused replacement, but becomes an issue if the temporary replacement had himself previously been tactically substituted. If the fourth official is notified that a player who has undergone a HIA will not be returning, then the replacement can kick for goal before the ten minutes has elapsed. If a HIA temporary replacement is sent off then the player having an HIA assessment is permitted to take further part in the game (as long as he/ she passes the HIA) i.e. The HIA assessed player can act as a replacement for another player. If a player passes the HIA he must return to play and the temporary replacement withdrawn. The HKRFU requested a clarification relating to Law 13. Drop out must cross the line. Team A have a 22 metre drop out. The ball does not cross the line and lands in the field of play before going into touch, some 8 metres from the 22 metre drop out took place. What advantage may apply? Can the non-offending team choose to have a line out where the ball went into touch, the option of a scrum or a kick to be retaken? Advantage only applies if the opponents play the ball before it goes into touch. Team A are awarded a scrum. 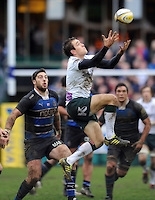 After winning the ball in the ensuing scrum, the hindmost player in that scrum grasps the ball with his feet or ankles and, whilst still bound to the scrum, bunny hops forwards with the ball still caught between his feet/ankles. b) All players: Handling in the scrum. Players must not handle the ball in the scrum or pick it up with their legs. c) All players: Other restrictions on winning the ball. Players must not try to win the ball in the scrum by using any part of their body except their foot or lower leg. d) …” Law 20.9(b) appears to determine the action (“bunny hopping with the ball caught at the player’s feet”) illegal and liable to penalty. However, doubt arises as to whether “legs” mentioned in the sentence includes the feet. On the other hand, Law 20.9 (c) specifically mentions feet, so this would appear to tender the action legal. Could you please clarify as there are diverse interpretations on this action across various countries and there appears to be ambiguity in the Laws of the Game? The action of “bunny hopping” as described is not permissible. 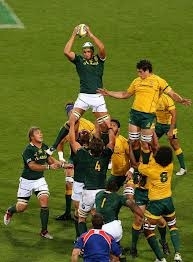 Law 20.9 (b) states that All players: Handling in the scrum. Players must not handle the ball in the scrum or pick it up with their legs. Sanction: Penalty kick. There is no ambiguity in this law. Law 20.9 (c) refers to winning the ball whereas 20.9 (b) relates to play after the ball has been won. Team A are awarded a 22 drop-out. The kick is correctly executed and the ball enters the opposing team’s in-goal area without having touched or been touched by a player in the process. A defending player picks up the ball within this area and touches down, making the ball dead. What should the referee’s decision be? The kick-off occurs at the start of each half of the match and at the beginning of each period of extra time. Restart kicks occur after a score or a touchdown. Drop-out: A drop-out is a drop kick taken by the defending team. The drop-out may be taken anywhere on or behind the 22-metre line. A drop-out is used to restart play after an attacking player has put or taken the ball into the in-goal, without infringement, and a defending player has made the ball dead there or it has gone into touch-ingoal or on or over the dead ball line. to have the other team drop-out again. c) If they opt to ground the ball or make it dead, they must do so without delay. Any other action with the ball by a defending player means the player has elected to play on. The Laws of the Game apply to the seven-a-side game, subject to the following variations. The variations presented for Law 13 end at Law 13.9. In the fifteen-a-side game, that Law refers to (Kick-off) ball goes into the in-goal. Thus, if no variations are presented for the incidents surrounding the drop-out, the “normal” Laws should be applied. Hence, our understanding is that in the seven-a-side game, in the event of a 22 drop-out travelling into the opposing team’s in-goal area without touching or having been touched by a player in the process and a defending player grounds the ball without any delay, the referee’s decision should be to apply Law 13.15. (option between a scrum on the 22 where the kick was taken or ask to repeat the drop-out). In other words, the Free Kick sanction applied in the seven-a-side game for infringements surrounding the kick-off does not apply to the restart kick (“22 drop-out”). Similarly, this would apply to a drop-out being incorrectly taken (law 13.12), not crossing the 22-metre line (law 13.13) or kicked directly into touch (13.14). a) A goal cannot be scored from a free kick. b) The team awarded a free kick cannot score a dropped goal until after the ball next becomes dead, or until an opponent has played or touched it, or has tackled the ball carrier. This restriction applies also to a scrum or line out taken instead of a free kick. a) When an attacking player sends or carries the ball into the opponent’s in-goal and it becomes dead there, either because a defender grounded it or because it went into touch-in-goal or on or over the dead ball line, a drop-out is awarded. To have a scrum at the place where the ball was kicked and they throw in. Team A is awarded a free kick. They opt for a scrum and win the ball. The ball is quickly passed to their fly half who drop kicks it through the posts and above the cross bar and the ball then becomes dead. As we can see, Law 21.6 determines that the attempted drop goal is not valid, however no mention is made to how play should restart. b) awarding only a 22 drop-out? This decision appears to be valid according to Law 13.10 Definitions, paragraph two and Law 22.7(a). Law 22.8 appears to deny giving an option to the opposing team in either a scrum at the place of the attempted dropped goal or a 22 drop-out. i) an unsuccessful kick at goal/ unsuccessful dropped goal, in which case Laws 13.10 and 22.7(a) should apply? ii) a free kick incorrectly executed, in which case Law 21.4 should be applied? Further to this; iii) In the case the ball does not become dead after the attempted dropped goal, should advantage be applied? Could you please clarify as the Laws of the Game do not clearly state how to restart play after the attempted dropped goal has been taken? The information below is intended to help develop an understanding between players, coaches and officials on how the laws of the game are expected to be applied for the approaching Sevens tournaments, and to assist in playing and officiating Sevens in your respective Unions. It is worth noting that the laws are intended to reward the team that is most effectively applying the Principles of the Game (contesting possession, continuity of attack, applying pressure, etc). Officials attempt to judge each situation by which team is legally dominating the situation through superior force, tactics, or numbers. This means that, in some situations, committing an offence might not lead to a penalty, depending on how it affects the opposition. For example, a tackled player that takes the “Squeeze Ball” position might not be penalised if there are no defenders contesting possession, but is more likely to be penalised if taking that position hinders a defender that was attempting to get the ball. Below is a video generated by Paddy O’Brien to prepare the officials for the 2014-15 Sevens World Series. Although not all of the clips will apply at every tournament, it provides a good resource for players, coaches and officials to prepare themselves. It is hoped that this video is self-explanatory. Please contact Laws@RFU.com if you have any questions or seek clarification. Question: Is the position known as “Squeeze Ball” allowed? Answer: If there are players on their feet trying to gain possession of the ball, the tackled player must release the ball immediately and not use his/her body or additional movements (such as an extra roll) to hinder the players on their feet from gaining possession. Question: Can arriving players put their hands on the ground past the tackled player? NOTE: If a player falls past the tackled player because of a lack of opposition, they might not be penalised, but must get back on their feet without delay. Question: Can a tackler’s support players at a ruck hold onto the tackled player as an anchor, if their shoulders are up and they are bearing their weight? Answer: A support player may touch or hold players on the ground provided that the support player is supporting his/her body weight. EXCEPT, if the defending team counter-rucks and the support player would have been driven backwards except for use of the tackled player as an anchor, then the support player risks being penalised. Also, if a support player is in contact with a ball-carrier before the ball-carrier goes to ground, that support player may remain in contact with the ball-carrier, but should get back to a weight bearing position without delay. (Law 15.6 a). Question: What are the restrictions on players chasing kicks with regards to making contact with opposition players waiting to receive the ball? Answer: Players in the air are vulnerable, and it is the responsibility of other players not to put them at further risk. Contact at kicks will happen, but referees are expected to be strict with any players that, by intention or recklessness, make contact with a player that is in the air. Just “going for the ball” is not enough to avoid penalty, the player must make a legitimate effort to get hands on the ball first; players that make contact with a jumping opponent and do not touch the ball are liable to be penalised, but if they manage to touch the ball when contacting the body, then play might be allowed to continue. Question: How will referees manage the often-chaotic Sevens scrum? Answer: Scrums receive less attention in Sevens, but along with general expectations on binding and timing, there are specific areas that referees should be monitoring: the defending loose head prop standing up or turning in at the scrum, and any props pulling their opponent forwards. Question: At a quickly taken penalty kick, how far do the defenders have to retreat? potent attacking option than in XVs due to greater space and fewer defenders in depth. Considering this, a strict interpretation of 10m could lead to repeated “not 10m” penalties against the defenders, which could magnify the impact of penalties beyond their intended value. An attacking ball carrier that intentionally runs into a retreating defender that has not yet fully retreated 10 meters, is an example of cynical play and the ball carrier should not be awarded an additional penalty – Law 21.9. We are concerned at the increasing practice of an opponent kicking the ball out of the hands of a player who has picked up the ball. (i) A fair contest for the ball. (ii) Can be considered a legal means of dispossessing a player. If contact is made with the hands of the player it can be considered foul play – this is difficult to see and to decide. If the ball is dropped, referees are ruling a knock-on, whereas the player in possession has neither lost possession of the ball, nor has he knocked it forward. Law 22.4 (e) Tackled near the goal-line. If a player is tackled near to the opponents’ goal line so that this player may immediately reach out and ground the ball on or over the goal-line, a try is scored. (f) In this situation, defending players who are on their feet may legally prevent the try by pulling the ball from the tackled player’s hands or arms, but must not kick the ball. Law 15.6 (j) – This Law is very similar to 22.4(f) above. We consider that it is logical for the rationale in Law to cover the scenario which we have outlined above in relation to the breakdown, and that the Law intends that it is not legal to kick the ball from the hands of a player in possession in any circumstances. The sanction for this action should be a penalty against the offending team. Scenario – Red No.3 (TH) is injured and replaced by No.18 (declared TH cover). No.18 then gets injured as a direct result of foul play. No.18 can be replaced but Red has no recognised TH on the bench and, as such, would have to go to uncontested scrums. Law 3.6(d) states that a player whose departure causes the referee to order uncontested scrums cannot be replaced. In the above scenario, can the Red team now continue for the remainder of the game, however long it may be, with 15 players – due to the fact the replacement TH has been injured as a direct result of foul play – which has to be verified by the match officials, or do they reduce to 14 (as per Law 3.6(d))? This scenario can relate to any member of the front row. It is noted that if the above were to arise then front row replacements must be used first for uncontested scrums. The WRU view is that the game should continue with equal numbers and Law 3.6(d) is not enforced. There is a direct correlation with HIA albeit a time constraint. In this scenario the Red team can continue with 15 players. The new clause to 3.14 was added so as to not disadvantage a team that had lost a player due to foul play. Law 3.14 should supersede Law 3.6(d) in the unusual situation where a front row player has been injured as a direct result of foul play. Following the recent announcement from World Rugby please see the official documentation explaining the Law Application Guideline – Contact to the Head. Please ensure you are familiar with the guidance before your next fixture by using the link below. It also needs to be re-iterated that there has been no change to the law with regards to the ‘Hand-off’. Law 7.1 Playing a Match – A Ball carrier may hand-off an opponent. The only point to note here is ‘Ball-carriers must be careful that they fend off tacklers legally and do not strike opponents.